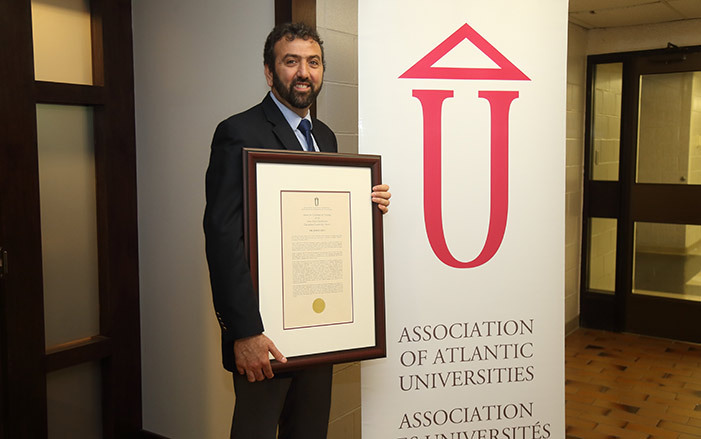 Dr. Emin Civi, faculty of business at UNB Saint John, has received the 2018 AAU Anne Marie MacKinnon Educational Leadership Award. This award, given to one outstanding educational leader in Atlantic Canada each year, recognizes a sustained commitment over an extended period to the improvement of university teaching and learning, within the nominee's own institution and beyond. Among other achievements, Dr. Civi has founded a number of programs within the business faculty to propel teaching excellence such as Faculty Teaching Colloquia and MBA Conversation Series, as well as having created mentorship opportunities for professors. To prepare his students for the real world, and to assist small businesses, he introduced a retail clinic and marketing lab in his classes. "Emin is a leader who forges ahead and a colleague who encourages and mentors others," says Margaret Anne Smith, lecturer in the faculty of arts. "Emin's approach to leadership is marked by generosity, relationship, and journeying with others." In addition to this recent award, Dr. Civi has received the 2017 Neil Scott Educational Leadership Award; the Hormel Meritorious Teaching Award from the Marketing Management Association in the United States in 2016; the AAU Distinguished Teaching Award in 2015; the UNB Teaching Scholar Award from 2012 - 2015, and UNB's Allan P. Stuart Award for Excellence in Teaching in 2011. AAU member universities propose nominees for these awards and the association's coordinating committee on faculty development selects recipients. The AAU represents the 16 universities in Atlantic Canada, is an advocate for the important role Atlantic universities play in preparing future leaders of our communities, in path-breaking research and innovation, and in contributing to the economic prosperity and quality of life of the Atlantic region.